Merrell's new 'hybrid trainer' is a rare beast, combining a lightweight daily use shoe with a grippy non-slip sole. It's ideal for those of us who work in a town or city but who also walk a decent distance and need something that can grip not slip on wet or rough ground. The shoes are available in stone with light blue trim, the dark grey and red you can see above plus the green and brown version you can see below. As well as a grippy sole inspired by climbing walls, the padded tongue is also fixed to the upper on one side, so you won't find it slides down or from side-to-side. 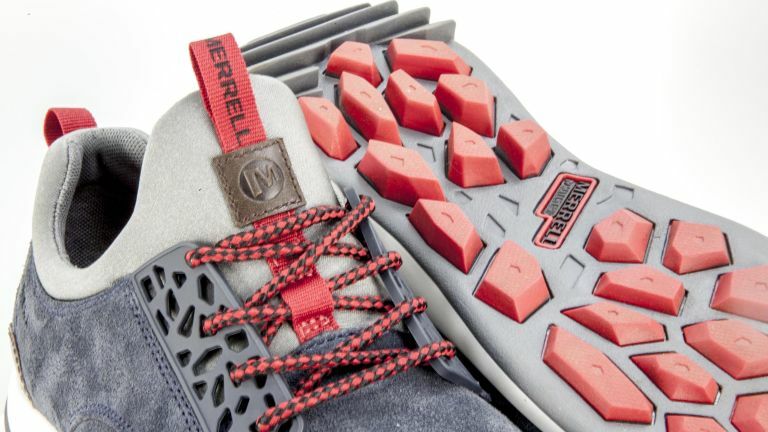 Merrell is now thelargest outdoor footwear brand in the world and is - according to Office's Willie Irvine - "respondingto a trend which sees performance outdoor brands increasingly being worn in the high street”. Available now, the green and brown version is exclusive to Office and costs £80. Liked this? Check out our guide to the best hiking boots.